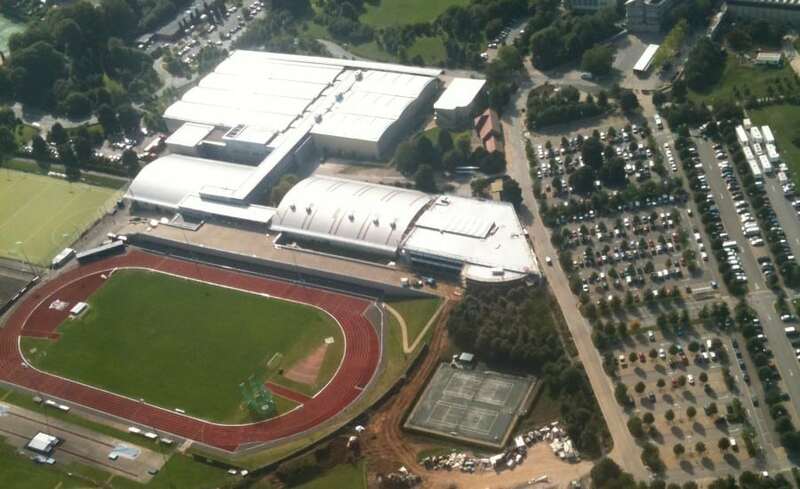 After a competitive tendering process, Architen Landrell were contracted to provide a 3 layer ETFE cushion roof system over the atrium of the brand new East Building at the University of Bath. Housing new computer science teaching labs, a 350-seat lecture theatre and smaller teaching rooms this is a high-tech building which was reflected in the use of high-tech design and construction materials. As a focal point to the new building, the client wanted to achieve a dramatic entrance foyer and atrium space including an apparently floating lecture theatre and access gantries suspended within a space. 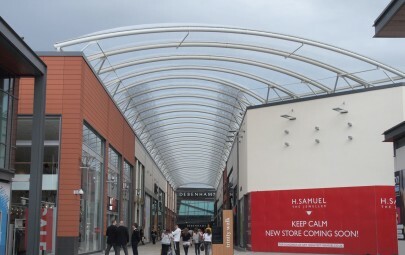 To enhance this, the architect was keen to include an ETFE cushion roof to maximise light transmission and introduce a clear view from floor to sky. Although light transmission was the key concept, solar gain and acoustics were highlighted as concerns which needed to be addressed in order to make this space a comfortable and efficient environment. Working with the architect, the Architen Landrell research and development team advised the options for cutting down light transmission (and as a result, solar gain) without visually limiting the light entering the space and in the end settled on a 50% hexagonal silver fritting. 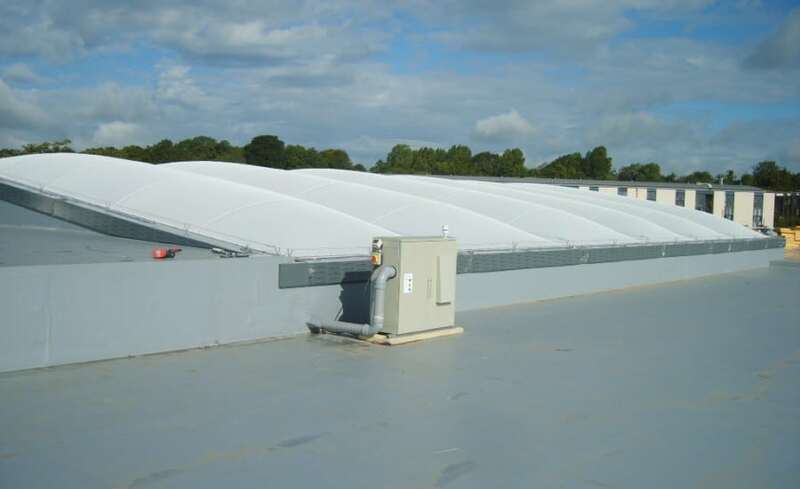 Acoustics were a different matter and, unusually for an ETFE cushion roof installation, the client decided to opt for a rain suppression mesh at initial install – we find they usually are retrofitted, if fitted at all! 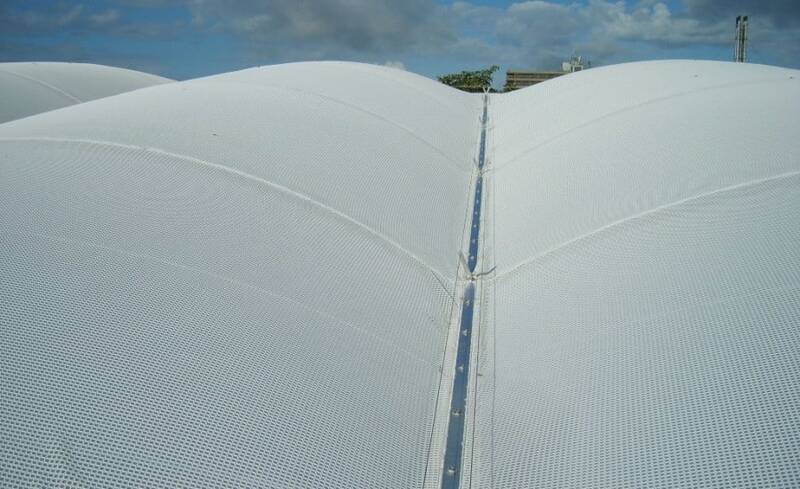 The mesh sits over the top of the ETFE cushions and is tensioned using the same extrusion as the ETFE uses. It acts as a dampener, minimising the sound of raindrops reverberating on the cushion surface. 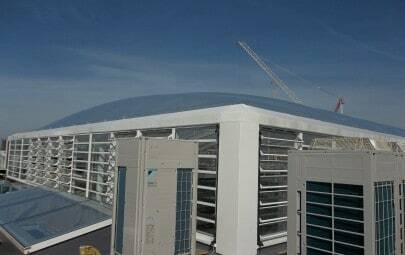 As a new build, it was essential that an ETFE contractor was taken on early to ensure that the loads imposed by the ETFE cushions could be incorporated into the engineering of the supporting steelwork which was being provided by others. 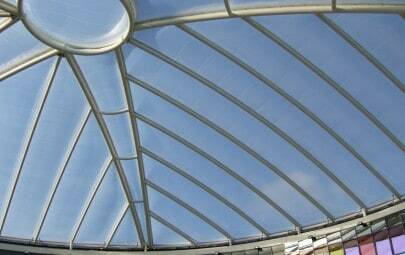 Careful design coordination was required to ensure the interfaces between the steel support structure and ETFE aluminium extrusion fixing details matched. There were also some complicated interfaces with flashings and the Sarnafil roofing fabric which added an additional design complexity. The steelwork installation by others proved to be extremely complicated and there was extensive design review and revision. However through close co-ordination with all the relevant trades and open channels of communication between the parties involved, the scheme was brought to successful completion. Through Architen Landrells proactive approach to working closely with the Cowlin Construction Site Management team, we managed to overcome numerous unforeseen obstacles, resulting in a very happy client and what we hope will be a long lasting relationship with all parties involved.